Exploring the horrors of war is nothing new to the word of cinema, but rarely has the subject of child soldiers been touched on and never with the conviction of Beasts of No Nation. An adaption of book of the same name by Uzodinma Iweala, director Cary Fukunaga (True Detective, 2011’s Jane Eyre) offers a brutal and uncompromising look at the toll war takes on youngster Ugu (newcomer Abraham Attah), who is forced to join group of mercenaries in an unnamed African country after civil war rips his family away from him. Falling under the thrall of the charismatic Commandant (Idris Elba), Ugu becomes a blindly obedient tool in the rebellion as his innocence is slowly washed away. Make no mistake, Beasts of No Nation is not an easy watch. Fukunaga’s script does not shy away from the grim reality of a world that we only see on new reports, the unfortunately common place acts of brutal violence becoming increasingly harrowing. The cycle of violence may become too much to handle, especially with a receptive second act that doesn’t seem to know where to go next, but stick with it and you’ll be rewarded with an incredibly powerful experience. Fukunaga’s cinematography is unbelievably beautiful, with vivid pink battlefields and brutal one take raids punctuating the action, but he doesn’t overly rely on these tricks, presenting the horror of Agu’s situation in an unflinchingly real manner. An early scene with Agu being encouraged to land a machete into a man’s head as if he’s chopping wood is absolutely horrifying, especially with how non-cahalantly the order is given, but there is strange sense of hope undercutting the story. Agu’s ever present voiceover informs us that Agu is never truly lost, and Attah’s impressive performance will keep you rooting for him as everything points to his innocence being destroyed forever. Elba commands the scene whenever he enters frame, effortlessly switching between charismatic and sinister at the drop of a hat. His impassioned speeches indoctrinate his charges with ease, and at times he seems to genuinely care for Ugu and the rest of his unit, only to urge them to embrace the violence around them. The unsure narrative of the movie’s second hour hurts the character somewhat, morphing it into something that doesn’t entirely ring true, but Elba remains strong, putting in one of the best performance of his already impressive career. But he has work cut out for him in the form of the 14 year old Attah, who is the real heart and soul of the picture. Watching him morph from high spirited teenager to ruthless killer is mesmerising, handling the nuance of the character with ease. 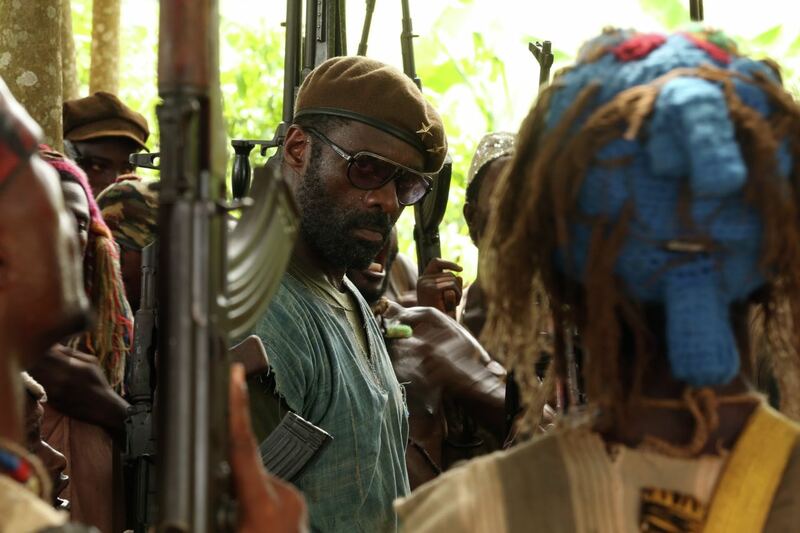 While the unflinching violence may prove too much for some, committing yourself to Beasts of No Nation will reward you with a powerful and beautiful piece of cinema.